View a collection of nearly 80 pieces of art that David photographed by clicking here! 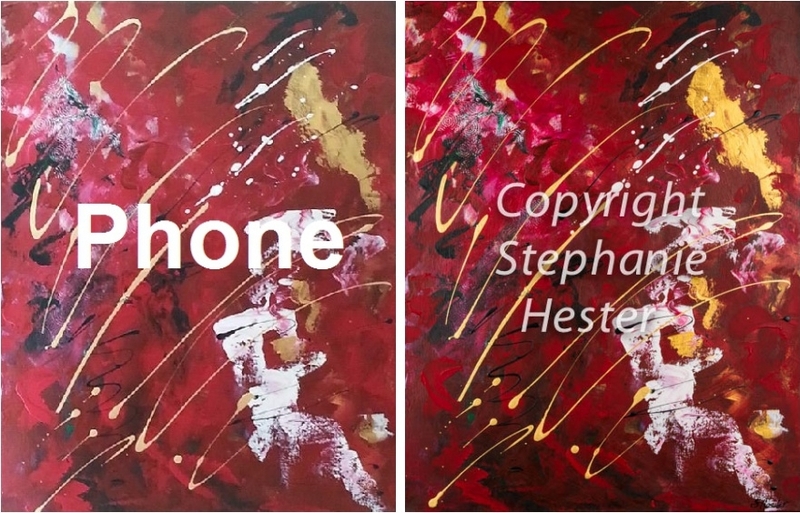 You can view the piece above for sale at http://fineartamerica.com/featured/the-spirit-of-christmas-stephanie-hester.html. The image on the left is one the artist took with her phone. The image on the right is one that I took in my North Raleigh Studio that on the 27.5 inch Mac monitor looked as color rich as the painting did beside the monitor. The artist even commented that the image on the screen was more vibrant than her original. The phone image is not a bad image, but if an artist plans to sell canvas prints for $100 to $500+ each, an artist should not rely on a phone image or for that matter a "nice camera" that is really just a consumer camera. The image on the right was shot with a Canon 5D Mark III with a 70-200mm Canon f/2.8 "L" lens on a Manfroto Tripod with two large octaboxes using studio strobes. Then, the raw file was pulled into light room with the piece of art beside the monitor for color match. I also used a color technique from the 1980's to help match the colors. Once the editing was completed, the artist received a high resolution 10MB image sized to 22 x 28 which is the same size as the piece of art above. The high resolution image can easily become a very large wall canvas print that will NOT disappoint a buyer. When hiring a professional photographer that will create a high resolution image that an artist will then sell prints of, it's NOT an expense but an investment. If an artist hires an affordable professional photographer, then it will not take very many sales to break even. That's the critical math. How much of one piece of art does the artist have to sell to break even (pay for the photographer)?